« Have business gurus (and business schools) lost touch? 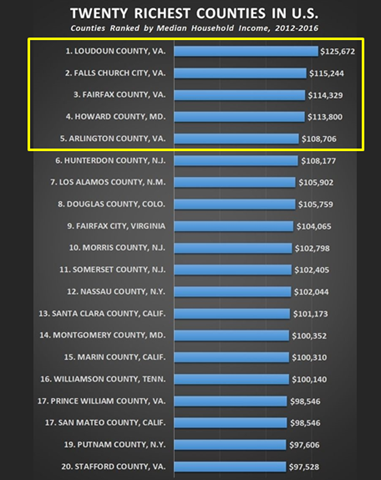 The five richest counties in the United States are all suburbs of Washington, D.C.
Loudoun County, VA tops the list … the median household income there is $125,672. As a benchmark, the median household income in the U.S. $55,322. New York, New Jersey and California have a total of 8 counties on the top 20 list. This entry was posted on December 8, 2017 at 6:50 am and is filed under Demograhics, Richest cities & counties, Wealth & Riches. You can follow any responses to this entry through the RSS 2.0 feed. You can leave a response, or trackback from your own site. While household income is a worthy metric, it seems at odds with academic rigor to equate income with wealth. Wealth – being rich – is a measurement of net assets, not income. If someone is rich, it is because they have lots of assets. If someone doesn’t have a lot of assets, even if they have a relatively high household income, it seems entirely wrong to label them rich. Households with “higher” incomes may well spend much of that income (vs saving/investing) and therefore could be “not rich” at all. Further, disposable income would be a better measure of relative wellbeing across the country, since it is well-known that housing is more expensive in the regions associated with high levels of household income.